F65 camera has base sensitivity of 800EI. In this mode you have 7 stops latitude over key and 7 stops under providing phenomenal Dynamic Range. 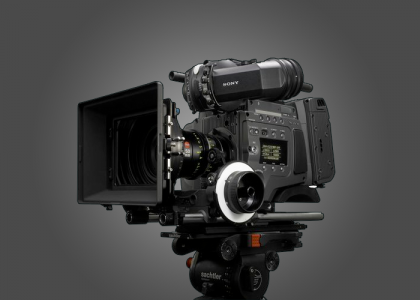 F65 covers a wider color space over any other digital cameras. This allows more headroom for color grading and future proof camera original material. The Rotary shutter has range of 11.5 degrees to 180 degrees. This eliminates CMOS motion artifacts. F65/RS also outputs shutter pulse for 3D /Motion Control rig application. With the rotary shutter you also have Built in ND Filters 0.3, 0.6, 0.9 and 1.2 Stops. In the viewfinder and monitor output from the camera, X2 and X4 magnification can be enabled for critical focusing. Ergonomics of the camera allows use of Film accessories such as ARRI, without any modification to the camera.